We do hold the world in our hands. Our hands control so much communication. A colleague of mine who is also a body language expert has got me thinking about hand gestures. Now the first thing that comes to mind is of course all the very rude hand gestures that have been developed over time. You often wonder how they all came about. Who was the first person to get annoyed and stick their finger aggressively in the air? Our non -verbal communication has such a big impact on how we communicate. Now I know that when I am training dental teams to answer the phones and communicate with patients and prospective patients and I am focusing very much on verbal communication. Verbal communication on the phone must be very clear and concise to be effective. There is no non-verbal communication used when you are speaking on the phone. Non-verbal communication happens all the time while we are on the phone. OK, the caller can’t actually see the non-verbal communication you are using but it definitely starts to affect the message you are sending verbally. I believe non-verbal phone communication has a very big influence on the caller and keeps you involved in the call and fully engaged. Smiling. You send a positive, “I am ready to help you”, message to the caller. The caller can hear your smile. Your hand gestures guiding the caller as you go through important steps helps the flow of the call. Head nodding in agreement with the caller even when they may not be quite right. A type of eye contact is happening even though you cannot see the caller. This creates a real focus with the caller and their words. The impact that non-verbal phone communication has on your caller should never be underestimated. Be aware that your non-verbal communication is influencing your caller and start being more aware of it. Non-verbal phone communication often comes naturally but once you think about it more, then you give yourself the opportunity to enhance the patient phone call even more. So sit up straight, smile, wave your hands a bit, imagine the caller is in front of you and look them in the eye, nod your head in agreement and make that non-verbal engagement with your caller. 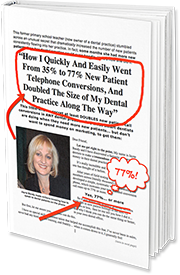 The Sydney Master Class is “How to Turn Every Dental Phone Call Into A Valued and Kept Appointment” on Friday 22nd June 2018. Click here for information on Sydney.